Staff members applaud as Britain's new Prime Minister Theresa May walks into 10 Downing Street after May met Queen Elizabeth in Buckingham Palace, in central London, Britain, July 13, 2016. Theresa May became Britain's new prime minister Wednesday and immediately put together her Cabinet to start the tough job of extracting Britain from the European Union. In a surprise choice, she named former London Mayor Boris Johnson as her foreign secretary. Johnson led the campaign to drop out of the EU. He angered and frustrated many Brits who voted to remain, along with other European leaders who believe Britain made a great mistake. May also appointed other Brexit supporters to major Cabinet posts, including former Foreign Secretary Philip Hammond as finance minister and Amber Rudd to May's old job of home secretary. Conservative lawmaker David Davis will take the newly formed job of minister in charge of negotiations with the EU that will set up the conditions for leaving. Those talks are expected to take as long as two years. 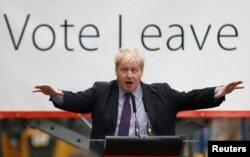 FILE - London Mayor Boris Johnson speaks at a Leave campaign event in Dartford, Britain, March 11, 2016. May is Britain's second female prime minister after the late Margaret Thatcher. Her day started at Buckingham Palace with an audience with Queen Elizabeth, who accepted David Cameron's resignation and invited her to form a new government. In her first remarks as prime minister, May said a post-EU Britain will be a country that will work for everyone and not a "privileged few." "We will do everything we can to help anybody, whatever your background, to go as far as your talents will take you," May said. "Following the referendum [to leave the EU], we face a great national challenge. And, I know because we're Great Britain, we will rise to the challenge." Acknowledging the everyday difficulties faced by many Brits, May said her government will listen to common people. "When we take the big calls we will think not of the powerful, but you; when we pass new laws we will listen not to the mighty, but to you; when it comes to taxes we will prioritize not the wealthy, but you," she said. White House spokesman John Earnest said the U.S. congratulates May, and noted she is familiar to many in Washington. "Given the nature of her previous position as the home secretary, she engaged with U.S. officials on a variety of national security issues ... those U.S. officials that have worked with her found her to be quite effective." Wednesday also was David Cameron's final day as the head of the British government. Before officially handing in his resignation to the queen, Cameron stood outside 10 Downing Street with his wife and three children. He called his six years as prime minister the "greatest honor'' of his life. 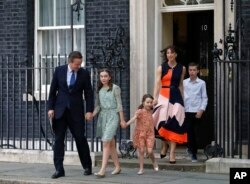 Britain's Prime Minister David Cameron, his wife Samantha and their children Nancy, Florence and Elwen, from left, leave 10 Downing Street, in London, July 13, 2016. He said he is leaving the country stronger and better off. The House of Commons, the lower house of Parliament, gave him a standing ovation in his final appearance. The normally raucous prime minister's questions turned into a friendly session in which he was praised for cutting unemployment, funding the National Health Service, and improving educational opportunities. Cameron also gave all but a guarantee to European Union citizens living in Britain that they would not be forced out of the country when Britain leaves the bloc. He said the government is working hard "to do what we want, which is to give a guarantee to EU citizens that they will have their rights respected." Cameron resigned after British voters narrowly chose to leave the EU in last month's referendum. Cameron had urged the country to stay.